Its name comes from being in close proximity to the Leal Senado Building. During the time when the Portuguese took over Macau, the square was where Macau authorities reviewed troops and police officers during their inaugurations. In 1940, a statue of Mesquita was erected at the square’s center. Mesquita was a Portuguese soldier who was known to be responsible for many deaths of Chinese soldiers during the Qing Dynasty hostilities. Understandably, the statue was destroyed by the Chinese people and was replaced with a fountain instead. This is also the reason why the square is also referred to as “the Fountain”. During the early 1990s, Macau authorities hired Portuguese experts to pave the square into a Portuguese-style, wave-patterned mosaic of colored stones. Since its paving, the square became a huge place for cultural activities in Macau. Firework displays and dragon and lion dances are usually held during special occasions where tons of Macau people flock to the square to join in on the celebrations. Buildings around the Senado Square also have a long history and remain well-protected by the authorities. No one is allowed to alter the façade of any of the buildings in the square. At the end of the paved road is St. Dominic’s Church with a museum of paintings, ornaments and sculptures that illustrate the Roman Catholic Church history in Asia. A walk north of the church are the Ruins of St. Paul, which might be the most famous landmark in Macau. Right side of the famous ruins is the Macau Museum which houses historical relics of the city. By walking towards the southeast from the square along the San Ma Lo, the Grand Lisboa Casino Hotel can be found in its entire splendor. 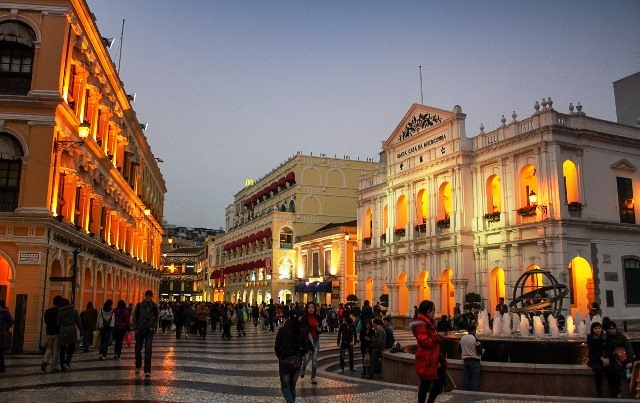 Other attractions and beautifully sculptured buildings in the square include the General Post Office, the Macau Business Tourism Center and the Holy House of Mercy built in the 16th Century that used to be a medical clinic. Shopping centers, traditional Chinese restaurants and Portuguese shops are abundant in the square. Clothes and yummy snacks are also common buys as the picturesque environment adds more to the square’s charm. Ginger milk curd dessert is a favorite buy at the square located at the building that faces the Post Office. To include a little civilized touch to the square, McDonald’s and Starbucks are available at the Largo do Senado. If there’s any celebration or festival going on in the city, there’s a good chance that the event is happening at the Senado Square. This beautifully crafted area has remained Macau’s urban center for centuries. To this day, it draws in huge crowds of both tourists and locals to see for themselves the multicultural dimension of the Macau community.